Just a quick post featuring my latest NOTD using another lovely polish from Anita! I used S-he Stylezone 427 which is a stunning pink holo. HOLO!!! It went on like a total dream - no cleanup necessary! The brush was great and it was super quick to dry. I'm very impressed so far with S-he polishes. Above is 2 coats which is needed for good coverage. Just look at the colours! Gorgeous. Please excuse my dry wrinkly finger and cuticles, it's just been so cold lately in Sydney! =( My hands get so dry by the end of day. 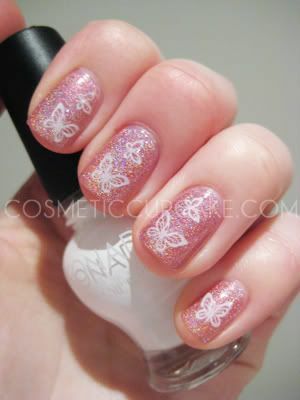 I then stamped butterflies using Konad plate m36 with Special polish in white topped with Seche Vite. On a side note, Seche is still my go to topcoat when I'm in rush (like when I'm about to go to bed!) but when I have time I reach for Nailene Acrylic Strong. Hope you like it! Don't forget to enter my 50 followers giveaway HERE! hello! I came by ur blog via some1 else's bt juz read ur profile that ur a registered nurse & interested in beauty/fashion.... altho I am not a nurse, wondering if u hv heard of exquisitejenn from youtube? Juz another registered nurse with awesome taste in make up and fashion that u shud get to know... =) bt I clicked follow to ur blog... so hope we do become good friends and share our thoughts in beauty too... Have a great day! aw this colour is super gorgeous on you! and thanks so much darling :) your blog is super cute! @Nikki: I'm glad you like it! It turned out better than I expected. @Anita: Thank you for sending me with this polish! It's my favourite holo by far! @Ronnie: Hi! Thank you so much for stopping by and commenting =) No I haven't heard of exquisitejenn actually. Thank you for letting me know! I will definitely check out youtube channel and her blog. I love this one it's so classy and chic. And the konad looks beautiful. Thanks for following me in return =) and the sweet reply too! @Rebie: Thank you for the kind comment! This holo is quite subtle in real life compared to others which I was really surprised and pleased about.